Half of my estate? Are you crazy? And the human race, free will. God has the ultimate free will. Or else God isn’t good and doesn’t want to do anything about it. This is a very logical and convincing argument. And we wouldn’t be here today. The father had already forgiven his son. He waits as the father in this story waits. Is available and abundant at our Father’s house. Acting as though God, our father was dead. And the celebration and feast ready for our return. On the icon of Saint Job. Traditions that have some sort of truth in them. We should be open to there being seeds of the truth elsewhere. And does not the bidding of any man. But their philosophers found something deeper. One God who would have an intermediary with man. And thus they were Christians before Christ. Before the actual cosmic event. But we can use this idea closer to home. Left in all the other Christians confessions. And some are further away. The seeds of the truth are there. To nurture whatever is good and true. Specifically for us here at Saint Job. We are to be bearers of the seed. May or may not have expressed an interest. But it doesn't have to be that overt or direct. This is what people are hungry for: Connection. And to God through Holy Communion. Or a good person or not. There's a three out of four chance that will come to nothing. But We don't know where the good ground is. Or where the Holy Spirit has already been working. We will bring Christ to them. Today Christ, Himself tells us the heart of the gospel, the spirit of the law: love God and love your neighbor. This is the core; this is the thing on which everything else hangs; this is what the Orthodox Church is: loving God and each other. But love is not merely a warm and fuzzy feeling, love is an action verb. Love moves us closer to God by moving us closer to our brothers and sisters in Christ. For each of us, each human person is made in the image of God. It’s not just merely loving God and each other. It’s seeing God in each other and acting like we do. Too often here in the West, and I don't mean Western America, I mean Western civilization, we think of spirituality, faith, and religion as an individual effort or action, as personal and private, something we do to make ourselves feel better, or at least to escape hell or gain heaven. But that is not what Christ told his disciples the church would be. He told them, “Deny yourselves take up your cross and follow me” and “He who loses his life, for my sake, shall save it” and, through Saint Paul, “Work out your salvation with fear and trembling.” It is a journey of the community, it is participation with Christ. There's an old saying in Orthodoxy: We’re saved together, but damned alone. When we cut ourselves off from the body, the mystical Body of Christ in the Eucharist and the mystical Body of the Church which are the faithful, we do ourselves injury, but more than that, we do injury to those who remain. It takes a church to raise a child. It takes everyone's example to show our children what they should be, to show them how to be Christians, to be members of the Church. We don’t know who they are watching or who they are missing. We don't know where the threads of the tapestry run. This one is absent today and that one is absent that day. The whole tapestry starts to come undone. It's not just to the absentee’s spiritual detriment, because we are together in this. It is to the detriment the whole body. We who are many are one, because we share one bread, one cup. We must draw closer to each other, know each other better, if we are to draw closer to Christ and know Him better. The Orthodox Church is not a minimalist religion like most of those that we are familiar with outside these walls. There's no finish line, no “I've done enough.” No holy days of obligation. No public profession of faith keeps you in this body. This is everything. Love God with everything that you are and love your neighbor as you love yourself. We are the church. This is not something we just do on Sundays. This is a torrent of never-ending, global prayer and worship. And when we come together, on Sunday, or a Feast Day, or even for a daily vespers service, we step, momentarily, into the midst of great cloud of witnesses, with all those faithful people, with saints and angels, past, present, and future who worship before the throne of the Almighty. In the fear of God, and in faith and love we draw near, and become saints, if only for a moment, holy and worthy through God’s Grace and love for mankind. This is something so much larger than Los Alamos or Saint Job, or any one city or parish. This is cosmic. But as great and universal as the church is, it suffers, it is diminished when its members are not present. For our salvation is tied together. Our journeys cannot be taken alone. Our tapestry frays. We lose our way without one another. The second commandment, “Love your neighbor as yourself” cannot be fulfilled in absence, only in presence. Let us not deprive ourselves of the eternal life that Christ offers us here today. And let us not dare through word, action, or our unnecessary absence, put our brother’s and sister’s salvation into question. We were all created for paradise. We were created to know, and be known, by God. This is paradise. Christ and his mother, and His saints are all here, today, present with us. This is paradise, this is heaven. We belong here. We are hitting the home stretch of the Great Fast. There is only one more week before the start of Holy Week, and two weeks until Great and Holy Pascha. For many the fasting starts getting harder now, and the temptations are getting greater, both for eating food that is proscribed and for falling into some specific sins. If we have been doing what we ought to be doing for the past five weeks, we have spent time in self-reflection. Possibly rooting out those habits and passions that we have ignored or rationalized away for the past year. But today we commemorate one of the greatest models of God’s forgiveness: Saint Mary of Egypt. We recounted her life’s story on Thursday night during the Canon of Saint Andrew. To sum it up: she was a harlot, a prostitute and worse, for 17 years. Before an encounter with the life-giving cross and the icon of Our Blessed Lady, the Theotokos set her on a path of repentance and asceticism in the desert. She spent the next 47 years of her life living the angelic life and becoming like God. Think of it. The last Sunday of Great Lent, every year for 1400 years, in every Orthodox Church, has been dedicated to a repentant prostitute. What greater image of forgiveness and amendment of life could there be? How important is forgiveness? The culmination of our work is reflected back to us in her. But it is not only her. One hundred years before Saint Mary, Saint Moses the Ethiopian was a murderer and an outlaw. He and his gang of bandits killed and robbed many people before his conversion to a life struggle and ultimately, holiness. But go back yet another hundred years and we have Saint George, a brave military hero who confessed belief in Christ before the emperor and became one of our most beloved martyrs. These three, blessed and loved saints are not alone. There are many more examples and they epitomize the Gospel lesson today. Those who are forgiven the most, love the most. We who realize that we are sinners are the perfectly imperfect vessels for God’s grace. An acceptable sacrifice to God is a broken spirit, not a self-righteous pillar of perfect faith It is in our brokenness that we are ready for the healing which Christ offers. God loves us; He loves us and knows us better that we know and love ourselves. He is the Good Shepherd, the Good Samaritan, the Great Physician, and the loving father of the prodigals, whom we all are. He created us the first time. He knows us from our mother’s womb. And when we fall and fail, and turn away, He stands ready, not in judgment, but ready to accept us back, to create us again. And again and again if needed. Until he makes us into his own likeness. Despondency is fear of God’s rejection, fear that we have gone too far, done too much evil, hurt too many people too many times. But God will not reject anyone who turns to him. True love casts out fear. Everyone is welcome here with Him. God is waiting for us to come to ourselves and turn back to Him. He stands ready to forgive much, once again. The Pharisee in today's Gospel lesson tells us how to be a good person: don't extort money, don't committed adultery, don’t be unjust, don't be a sellout. And as good Orthodox Christians, he is our example in fasting twice a week and giving 10% of his income to the church or temple. So the Pharisee is a good person, right? Of course! He is a pillar of the community, he is a leader in the temple. All these things that he does are good and correct, and we could take a lesson from him. So why is the Pharisee not the hero of the story? Because his ledger book reads all black. He knows exactly what he's done to gain favor with God and in the eyes of men. And in his own eyes he is justified. He deserves all the good things in this life, because of what he is done. The publican, on the other hand, knows that he's a sinner. He knows that what he's done in his life has separated him from other people and separated him from God. And so he doesn't even go into the temple he stands out in the courtyard and he doesn't lift up his eyes. It is the opposite prayer of the Pharisee. In everything that we could see the publican would not be considered a good man. He sold out his own countrymen and worked for the Roman government. He lived off extorted money from them and was generally the worst kind of sinner in the eyes of his fellow man. But he knows his place before God and he knows that he doesn't deserve anything. We're coming up to Great Lent very soon: a time of penitence, a time for reflection, a time of cleansing. But as we work on our own spiritual health we must watch and be careful in this time, lest more insidious sin creeps in. Yes we can and should fast during this Great Lent. We should give alms and increase our prayers. But we must be careful that we take no pride in the work that we do and we make no judgment against those we see around us that don’t. There's a story of a group of young enthusiastic monks who devised a fasting rule for themselves for Great Lent. It was very strict, more so than most other monastics observe. So they went to their spiritual father and asked for permission to keep this rule. Their spiritual father in his wisdom allowed it on one condition: midway through the fast the young monks must all have a large steak dinner, thus ruining and breaking the rule. With the fast broken in such a blatant manner the young monks would no longer be able to take pride in accomplishing the fast. Humility is more important than fasting. Humility is the mother of all virtue just as the reverse is true; pride is the mother of all sin. Gluttony, Anger, Lust and all the deadly sins have their root in pride. In a quantitative way are we truly the worst sinners? That's not for us to decide, but when we stand before perfection, we stand alone before perfection and in that solitary moment before Christ. We acknowledge our sin and our sinfulness. Even the greatest saint as he approached theosis would see more clearly his sinfulness. When we lead sinful lives the little stuff doesn't even show up. But as we grow, as we use confession more often, as we strive in synergy with the Holy Spirit to become holy ourselves, even the little stuff will become grotesque and horrible. May we all take the Jesus prayer, the prayer of the publican, to ourselves during this upcoming fast. Today's Gospel lesson has a blind beggar calling out to Jesus, asking him for mercy. A man, disabled and living on the fringes of society, in a society where there were no social security programs or benefits for the disabled. He literally lived on the charity of others and starvation would've been a distinct possibility. But as he hears that Jesus is coming near, he calls out to him. The people around him tell them to be quiet and not to bother Jesus. It is the same with us today. We are all like the blind man at times. When things are going wrong in our lives, we may cast about call for Jesus, this person who has given so many people hope across the centuries, but maybe only as a last resort. The modern world will tell us to be quiet, tell us to believe in ourselves instead, tell us to buy the next self-help book. “Don't go to Jesus for help. Christianity is a dead religion out of touch with your current reality.” But this denial only comes from a cynical heart. Don't call on Jesus …because I was hurt by what people in the church did, I was made to feel guilty, because I am angry. But the blind man had hope even though he was told to be quiet. He knew that if he didn't call he wouldn't be answered and so he had the hope of the call. This man had probably heard that Christ worked miracles, that he made the lame walk and the blind see and cast out demons. We hear the same stories too. And so this man had hope. Do we? Or have we let the world in? We let the message of cynicism, of materialism and radical individuality in so much that we will not acknowledge our helplessness. In the 12 step program, part of the first step is acknowledging that you have become powerless to change your situation. We have been in control of our lives so far and where has it gotten us? However, it is in our weakness that God can show His strength. A broken and humble heart God will not despise. He can use us best when we are empty. This poor blind man, he had little hope of changing his situation under his own power. But he had enough hope to reach out in faith and quite possibly desperation. Lord have mercy upon me! How often do we say that here in church? Lord have mercy upon me. Do with me what you know is best; do for me what you think is best for me. We commend ourselves and our whole lives to Christ our God, but do we mean it? When things seem out of control do we put into practice the latest self-help strategies? Do we look for another counselor, psychiatrist, or doctor? Or do we first say a prayer? When things seem to be going wrong do we pray? Prayer should be our first reaction for everything, both good and bad. It's not to say health cannot come through doctors, psychiatrists, and counselors, but we are whole people. We are spiritual at our core and we must deal with that part first. An evil spirit undercuts the most healthy body and mind. At the end of our Gospel story the man receives his sight and Christ says go, for your faith has made you well. There is no way to be whole and healthy without a healthy spirit. And there's no way to be broken if we do have a healthy spirit. Peace, contentment, and joy are the consistent fruits of a healthy spirit. All of the sacraments of the church are served for the healing of soul and body. But we always say soul first because everything depends on that. A peaceful soul can endure any external barrage and still take joy in the hope of the eternal resurrection with Christ. While an agitated soul, vexed with sin and anger, would not be content or peaceful even under the most perfect conditions. "Those who sat in darkness have seen a great light." 400 years before the birth of Jesus Christ, Plato, the great philosopher wrote about his famous cave. It is analogy for the world, where the vast majority of people sit chained in a cave and only see shadows on the wall, and believe that they are seeing reality. True reality, however, is outside the cave casting the light and shadows on the wall which they see. The goal of life, in Plato’s philosophy, was to leave the cave through enlightenment and join the real world. It's interesting that the great philosophers we're looking for illumination of a darkened conscience. Somehow he recognized that darkness was greatest hurdle humanity had. Now when Jesus said this, “Those in darkness have seen a great light,” He was speaking about the Hebrews who had the Law of Moses at the center of their religious and cultural lives for the past 2,000 years or so. They had a vast and comprehensive list of dos and don'ts. They had a morality. In essence, they had a ledger system. Don't do that, do this, and you will have earthly blessings, material prosperity, long life, and lots of children. But that legal system set in place nothing for the change of the person, for their spirit. There were those who pleased God and did what God commanded, and those who displeased God and were evil, but there was no drawing near to God, no enlightenment, no illumination. There was a wall between the true light and fallen humanity. What Christ's incarnation did was to pull down that wall. It allowed the five senses to experience God, because God had become part of created nature. It is why we see so much gold in iconography. It's representative of the divine light, the light which comes from, the energy which proceeds from the uncreated Godhead. The richness and beauty of the gold only barely hints at the brightness of the uncreated light, the illumination which is available to us. This nothing less than participation with the divine. There's nothing more enlightening than this. There is nothing more radical than the idea and the possibility of truly and in reality approaching divinity. But Christ is this just that. He showed us the way back to paradise. But even more than that, Adam was not created perfect as many people think. Yes, he was created without sin and walked and talked with God, but he was not complete, he was not mature. He was told not to eat of the tree of the knowledge of good and evil, not because he would never eat of it, but because it wasn't time for him to know. He wasn't ready for the illumination, for the knowledge. If he had not eaten of that tree, many Orthodox theologians believe that Christ would have still become incarnate. But instead of only being unified with his creation, he also came to redeem the world from the fall as well, through His death and resurrection. We stand in paradise at this moment, as Adam did, but we stand here with God-man, Jesus Christ, the Light of the world, unified with us. There is nothing on earth greater than this liturgy which we are offering God this morning, because we are participating in heaven. Last week I talked about the journey that we're all on, and that our goal should be to become closer to God and more like Christ. And really, that's the definition of a saint: a person who is like God, like Christ. But that goal can seem unattainable. I'm not a saint. I can't be a saint. I sin all the time. It's too much to take in in one sitting. It makes us want to give up. I can't do it. I can't follow the rules. So why really try? But we need to take a page from St. John Maximovitch, who reminds us that it's the small things that count. The greatest good that can be done for mankind has been done. Jesus Christ, through his incarnation, death, resurrection, and ascension has built a bridge across the uncrossable chasm. The insurmountable goal has already been achieved. The greater good, the grand gesture, the heroic feat has been done. And now it is up to us to do the small things that matter so much in our daily lives. The most beautiful golden chains of the most complex jewelry patters are made up of very tiny but very simple links. A tiny circle of gold. And it is the same with our good deeds. We don’t need to worry about the grand design in our lives. We don't need to aim to be Mother Teresa, to be a champion, or a hero. We need to do the next good thing. The Gospels describe them as simple as giving a glass of water to a person who is thirsty. It's a very easy thing to smile at people that we meet every day, to take an interest in someone else's life or struggle, or to give a kind word here and there. They are very small things just like the tiny golden links in a chain. But do these things outweigh our sins? Do they make up for our mistakes? That is missing the point. Our sins are cleansed through confession and repentance, and are not present in our life's final product. The good will remain. It's been suggested by social scientists that a person needs eight kind physical touches every day to be healthy. How much more do we need kind words? How much more do we need encouragement and affirmation? Children in school are much more successful if just one adult takes an interest in their progress. One interaction, one kind word, one kind deed. This is how we are to life, from one kind interaction to the next. And they will build upon each other if we make it a habit to be kind and gentle, to be a peacemaker. It's all fine and good to sit down and contemplate great thoughts and grand truths, to make goals for the distant future, and set a good direction. But sometimes, maybe most of the time, life is just too much. It's too hard to think about the future when the present is difficult, and the memories of our past brings us down. Instead, we must do the next good thing. We must help each other across that great bridge that Christ built for us. This coming week let us all look after what we say. Is it kind? Is it true? Is it necessary? If it is not these things, let us instead set a guard over the door of our mouth. In other words, if you can't say something nice, don't say anything at all. But more than that, put one foot in front of the other. Do one kind thing at a time. Let us live in the moment and live for making those golden moments that will define our character and build our future. In today's Gospel reading we have four kings. There are the three kings, or wise men, or magi, from the east, and then we also have King Herod. King Herod was Herod the Great. He was literally the king of the Jews, of the lands of Judea. However, he was put in place and controlled by the Roman Empire. He was the greatest builder in Jewish history since Solomon, who reigned hundreds of years earlier during Israel’s golden age. Herod rebuilt the Jewish Temple. But he was an evil man; he killed to gain and keep his throne. He was probably hated by most Jews because he was a puppet, a sell out to the Roman state, and a violent one at that. When Herod found out from the three wise men that there was another born king of the Jews, he was scared. The three wise men, when they arrived at his court, probably expected Herod to introduce them to his new son, the new heir and next king of the Jews. But he didn't have one. Herod didn't know the prophecies and so he feared for his position, and all of the ruling class of Jerusalem feared with him because their positions were tied to his. Their security was based on his security. He was comfortable in his position and rule. On the other side of the coin are the three wise men, or magi, who came from the east, probably Persia, and their goal was merely to pay homage and worship a king who was important enough to be announced by an astronomical event. They traveled from the east for nearly two years since the star had appeared. Now today we like to say, sometimes casually, that we are on a journey, that life is a journey. But it's true especially when one is talking about orthodoxy. We are not born with the truth, with an innate sense of God’s presence, and so there always has to be movement. Some of us are cradle orthodox, born into Orthodox families. Some of us have only recently found the faith, but something has drawn us. We have seen a sign. Whether it is a sign that we were familiar with for our whole lives. An Orthodox person raised in the faith may have been surrounded by these things and yet not seen them for what they are: calls to strive and move and journey. Some of us started out as atheists, or Nazarenes, or Lutherans, or Episcopalians, but we somewhere along the path recognized something of the Truth. Whether it was the arts, the icons, the music, the symbolism, or the history, or the liturgy of the church, we spotted something and we started our journey. The important thing is to continue the journey. We must not be like King Herod, comfortable in our position and satisfied with our progress, living in a temporal promised land. His reaction was fear when his position was threatened. When we are satisfied with our spiritual life we will react with fear to any new information that questions it. But if we are continually on the journey, if we are striving to draw closer to God and to be more like him, we can be open to the new and unexpected. Because that which draws us to God will continue to draw us, and the closer we get the more we will be drawn. If our faith today is exactly the same as it was a year ago, or five years ago, or 20 years ago, it's stagnant. We must continue the journey. We must be called higher and deeper. We must follow the star that sheds light over the entire universe. In today's Gospel we have one of those long genealogies that the Bible is famous for. There are only two of them in the New Testament. Most of the really long ones with the difficult names are in the Old Testament. This one links Jesus Christ historically with Abraham and King David. Matthew, the author of this gospel, was very interested in making the link between Christ and the founders of the Jewish faith. He was writing primarily to reach the Jewish population. Matthew links Joseph, Christ's earthly father, to the patriarchs. The other genealogy in the New Testament is in the Gospel of Luke, in the nativity narrative as well. But Luke links Christ back all the way to Adam, whom he calls the Son of God. Luke was writing for a wider audience. But either way, here we have represented a history--all the people who were involved in bringing about the person of Jesus Christ. We and our society today mostly live in nuclear families. Families who, when the children are grown, split and move away. Putting down new roots wherever there's education, opportunity, or employment. And that, in a sense, starts over a family’s history. Some families are different and have deeper roots than others, stronger bonds that bind them together, but here in America the younger generations are more separated from the older than ever. But history is important. Continuity is important. Without it, we're constantly trying to define ourselves. And each new generation needs to redefine itself because it doesn't have a sense of history. Tradition is seen as something dead. The people in this genealogy knew who they were; they were linked to something bigger than themselves, to a tradition, to a culture, to a grand arc of history, to the Jewish nation. But the Jewish nation, as the chosen people of God, completed its run when their leaders and the majority of the people did not recognize their Messiah. In its place, the church, the apostles Jesus called and their descendants in the faith became the new chosen people. Our faith is historical, but it is alive as well. Tradition is not a dead set of rituals. It is the life of health and wholeness in the church. I have heard the Church defined as a human institution, a conspiracy of the twelve, and a concoction of Paul of Tarsus. There are many historical problems with this argument, but one of the greatest is the sheer longevity of the Christian Church. No human organization, nation, empire, or ideology has lasted nearly as long as the Church has. One could say the Church and Christianity have lasted for almost 2000 years, but that is separating the Christian Church, as the chosen people of God, from the Old Testament chosen people of God. The church has existed from the time people existed to worship God. The Roman Empire rose and fell. The Byzantine Empire rose and fell. The British Empire rose and declines. America has peaked. It would be silly to think that the America we know, with this system of government will last for another 200 years, much less be eternal. The only thing that differentiates us from the Roman Empire is our level of technology. But there is something on earth that is eternal and that is Christ's Church. It lasts simply because it is not a man-made institution. It is populated by people, but it was divinely instituted. The Church has outlasted every naysayer and every critic. It will out outlast us. It will outlast America. It will outlast everything we know, but we are part of it, an essential part of it. We are part of something bigger than ourselves and we are called to play our part, to find purpose in this lineage of people called by God. We worship God here in His church and someday we will worship perfectly as the church triumphant in the next. Today's Gospel again shows this image of a banquet, a feast, as we are preparing to break the fast in two weeks with the feast of the Nativity of our Lord. Jesus likes to give examples that have to do with meals because we are so familiar with them. Who doesn't like a full table? Who doesn't like to be surrounded by their friends at a party? There's nothing worse than throwing a party and having no one show up. We all know this. We all know the desire of having our friends accept our invitation. They enjoy with us in making merry, and multiply the joy we feel. This is the Gospel, this is the good news of Christ. This is what God wants of us: to reciprocate his invitation. He wants to reconnect with us and so he has given us this invitation. Come and dine with me here. I will give you eternal joy. The afterlife with God is often likened to a banquet, to a party. Who would turn down an eternal party? But I have things to attend to. I have a new house. I have a new business, a new car, and a new wife. These are the things that I have to take care of now. These are the things that distract us from the important thing. There is one thing needful. We have one choice to make. Even the wisdom of this world tells us that the things we have are not lasting, and are not worth worrying about. What will it matter and hundred years, when I'm dead and gone, what car I had or what position I held? You can't take it with you and hold on loosely. Everyone's grave looks the same. But will we be with God at that banquet? Will we have chosen to enter in? There is nothing so painful as rejection, and yet we are allowed to reject this invitation. God has given us free will. He has made us like himself and we are allowed to thwart the divine plan. There is nothing we can do to pull down the kingdom of God and put something else in its place, but we can separate ourselves. We can say, “God, I want no part of this.” And if we do, for eternity we will stand there at the door railing at God because we've done the same in this life. Why would someone think that after denying God throughout this life, they would suddenly be able to recognize him in the next. There are those who seem to have already made it. There are those who received a call from God very early in their lives and they may think they have it. And they may--we're not to judge. But now God is looking for those who don't have it all together: the maimed, the blind, the lame, the broken. These are the ones He will fill up his banquet with. And who among us doesn't identify with being broken in some way? I've been told that in years past, people of this congregation have called themselves "the island of misfit toys." It's just those kind of misfits that Jesus wants to fill his banquet table with. He will have a full table. It will be quite the party. Those who have the odd picture of sitting on the clouds and playing harps for all eternity are way off. I have no idea where that image comes from, other than Hallmark. There will be joy, there will be feasting. I have no doubt there will be laughter. Do we truly want to be part of this? Or do we want to lock the door from the outside? This is the one question. There is no other question that has any meaning whatsoever in comparison. In this life, am I rich or poor? Am I hungry or full? Am I happy or sad? More than all of these, and the question that puts all of these questions in their place of irrelevance is: have I accepted the invitation of God to eternity with him? Heaven will be full. Do you want to be in or out? There's plenty of room at the table. Taste and see that the Lord is good; His mercy endures forever. Amen! Once in a while in the Gospels, Jesus really gets after the Pharisees. This is the case in today's reading. He heals a woman who has been sick for a long time, and He's criticized for it. For doing work on the Sabbath. The Sabbath was the Jewish holy day, the seventh day on which God rested. And it was a day with very strict rules as to what work was allowed to be done. But what Jesus points out is that we are to care for people, always. He asks, wouldn't you take care of your animals on the Sabbath? How much more precious are people than those animals? And all his critics had to be quiet. There is something about the message of Christ that is eminently practical. The question that is posed; the question that is debated between the Pharisee And Christ, and the one which Christ has a great answer for, is, what is really important? What is really the goal in life? Is it to follow rules? Is it to do what is politically correct? Is it to fit in, and blend in, and be successful? The Pharisee was all of those things. Or is it to be virtuous? Is it to care for people? Is it to go outside ourselves and identify with other people? When put this way, the answer is obvious. Virtue has been the goal of most of human society since the time of Plato. The definition of specifically what is good changes a little, but it is relatively constant. A virtuous person 2,000 years ago would be a virtuous person today. What do you want to be? You want to be good. What is the ideal? A virtuous life. A virtuous life can be lived by a rich man or a poor man; a healthy man or a sick man; a man or a woman. Because the goal is goodness, it is truth, it is virtue. But what we have done in this country and in Western society, is we have turned to those things which are at tangents to the goal of virtue. Being rich or poor, powerful or weak, have little to do with being good. We can find plenty of examples of very wealthy and very powerful people who do evil. We can find poor people who do evil. These are not or should not be our goals. But we have turned to them, and we have turned to making them the goal. What is the goal of life? The goal of life is not success however one defines it. A good, long retirement, physical health, physical beauty, comfort, etc. None of these are in and of themselves virtuous, none of them are inherently evil. These are all things that the Pharisee would identify with. He would follow all the rules. He would be successful. Had a good income and beautiful vestments. But Christ punches a hole in his world-view and said: what are all of these things, if you don't even have the sense to take care of a person that needs you? This path we tread as Orthodox Christians is not an easy one if we are true to our word, and live this life in preparation for the next. If we do not live for advancement here, we will be different. Someday we will be more than laughed at, we will be persecuted. 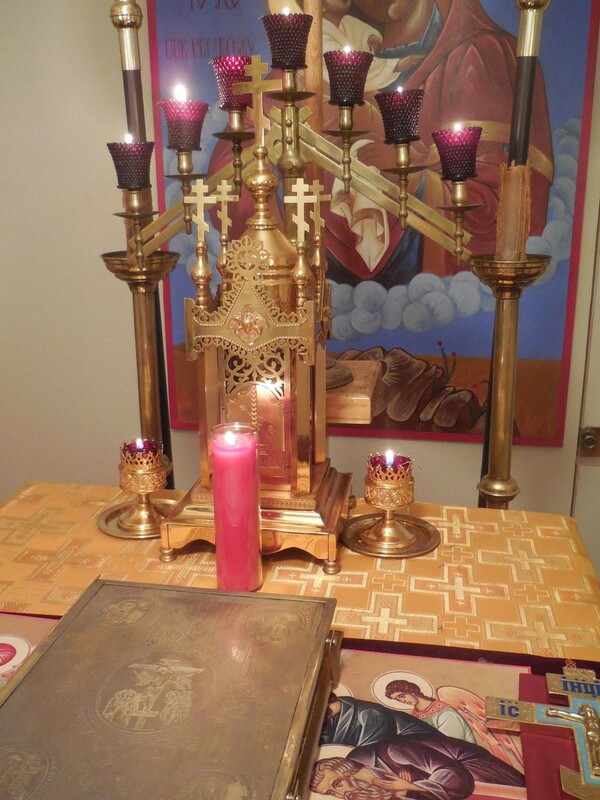 But we must make sure that these external forms that we keep: the liturgy, the icons, the vestments, the prayers, we must make sure that these things continually drive us toward our goal, and that they do not become goals in and of themselves; much like wealth, fame, and success have now become goals to those around us. Why are we here? Why are we here in this church this morning? If the answer is anything other than becoming like Christ we must reevaluate why we are here. It's time to get serious. It's time to walk our faith in the sight of others. It's time to refocus on what is truly important. Worldly Attachment or Rich Toward God? Most of us live very comfortably. Although we may have money problems or health concerns, most of us are very wealthy compared to a global standard. If you take a hot shower every morning, you're probably wealthier than 75% of the world. And yet we worry. Will this job? Will they renew my contract again? Will I get that raise or that promotion I need? But most of us have we need and a lot of what we want. Cable television, internet access, a relatively modern car, etc. We have enough and even to give a little. And yet we worry. Why is that? Is it because things cost so much? Or is it because we are attached to the idea of security? I had a long discussion about finances with a Roman Catholic friend this week. He complained that his priest would often stand up and say you're not giving enough. This is what we need to run this church and we are falling short. It annoyed him, because it was always about money. And yes it is important to keep the church running. But God doesn't need your money. Running the church and being able to pay the priest is a byproduct of cultivating a generous spirit. Putting money in that basket is not so much for the church as it is for you. Our goal in giving should be to become, as the Gospel lesson says, rich toward God. The Gospel lesson today talks of the rich man who had more than enough, but he only thinks about how to get more. We are in one of our fasting periods right now in preparation for the nativity of our Lord. And along with fasting we are always instructed to increase our giving. Fasting teaches us that we should do not rely on food. Almsgiving teaches us that we should not rely on money. These two practices coupled with prayer show us what we truly rely on. It is he who is made us and not we ourselves. It is in Him we live and move and have our being. We are the apple of His eye and the sheep of His pasture. To become less attached to this world is our goal. If the events of the past week have taught us anything, it is that life is fleeting and the end can come in any moment. This life is a decision and in this life we decide where we will be for eternity. If we build bigger barns, if we open another bank account, if we buy a little more insurance, will we be more secure? The barn and the food will go to others. The bank account will be drained by someone else and the insurance money will be collected by someone else. And all that means anything to us in this world will become someone else’s. And we will have nothing. It is the attachment to temporal security rather than resting in God that is the root of evil. What do we love? Do we love the things of this world? The comfort, the entertainment, the gratification? These things are fleeting, these things won't last. You can’t take it with you. To become rich toward God is to care less about this world and to center ourselves on Christ. During this time of fasting, may we all refocus on things eternal and put aside those things which draw us away from God. One of my favorite movies of all time is the musical, My Fair Lady. You know the one with Rex Harrison and Audrey Hepburn. Anyway, one of the most interesting characters in that movie is one that is often overlooked, the father of Eliza Doolittle, Alfred P. Doolittle is a common dustman, a garbage-man. When he comes to Doctor Higgins about Eliza’s living arrangements he identifies himself as something very interesting: he is one of the “undeserving poor.” He realizes and accepts the judgment society has passed on him. He readily acknowledges that most of the money he receives ends up in the hands of the bartender. He asks only for what is fair, not for what he deserves. We are all part of a society which delineates between the deserving and the undeserving. Between those whom we can feel good about helping, and those whom we should leave to their own devices or to the consequences of their own actions. But today's gospel lesson strikes at that delineation it strikes at the divisions in society. We are not told who the traveler was. Was he of the noble classes? Or was he poor? Or a refugee? All we know is that he was traveling, and that he had everything taken away from him. The priest and Levite, the men of the cloth, don't fare well in this story. They see a man in need and they do their very best to ignore him. Exactly the opposite of what they are supposed to do. But a Samaritan, one who is an outcast in this place, at this time, took pity on the beaten man, and went out of his way. He spent his time and his money on someone he didn't have too, or have any responsibility for. It's a dog eat dog world out there. And we have to take care of our own, right? Here's the thing. He was not taking care of his own. Or more to the point he was taking care of his own, but he recognized the humanity in the other person. When St. John Chrysostom speaks on this parable The lesson he pulls from it is that all people deserve our help and that God puts people in our path for us to help. They are not inconveniences. They are not hypothetical situations. They are not one of “those people.” They are our people because they are God’s people. I have pointed out before the anagogical meaning of this parable, how Christ is the Good Samaritan and that we are all beaten and left half dead. But that is all the more reason for the us to be Christ-like. We need to take the time and expend the effort to respond to those in need around us. They're placed in our path for our salvation, not for theirs. May we all see, and respond to the people and their needs that are presented to us. And thus become ready receptacles of the grace God will pour out on us. June 19, 2016 -- In the Name of the Father, and to the Son and to the Holy Spirit. Amen. Today is Pentecost. Today is the birthday of the Church, Green Sunday, when we celebrate the new life of the Church, a life in Christ as His mystical body. But we are also just one week from one of the largest mass killings in the history of the United States. This past week I spent every day in Santa Fe with Elizabeth and Diane, and fourteen other people learning how to paint icons. But commuting to and from Santa Fe every day presented an opportunity which I don’t normally have: I listened to talk radio for two hours each day, an exercise I do not commend to anyone. It formed a picture in my mind of our society that was much less than healthy. Fear and hate, blame and fault, these were the subtexts present in all of the discussions. It was a radically different than how the rest of each day went, full of prayer and learning, beauty and love. We have brought some people into the fold, but we are not converting people at a stunning rate. Although we are becoming known in this community, and known as kind and good people, even if we were to quadruple our numbers we would still be less than 1% of this local population. Our purpose is here in today’s Gospel, and reiterated in other readings. It is summed up in an analogy of Christ: “I am the light of the world.” And we are the Body of Christ. We are the Salt of the Earth, and the leaven, the yeast, which raises the dough. Now, light doesn’t reach everywhere. Shadows are almost necessary for us to understand what we are seeing. Neither do we eat salt or yeast, straight. Salt makes food savory; it makes it more flavorful, but it also preserves. And a little bit of salt goes a long way. A pinch of yeast can raise and transform a number of loaves of bread. And a tiny candle in a darkened room can make all the difference. We need to see ourselves as the true church in this way, not just as some sort of club that we attend on Sunday morning. Or worse, like a few faithful saved from the sinking Titanic of the world. We have saved very few but the grace of God extends further than we can imagine. Metropolitan Joseph of the Antiochian Church has said, “We know where the grace of God is (here in the church), but we don't know where the grace of God isn't” We don't know how far it extends out into the world, but we do know that it extends from and originates in the Church, from the mystical body of Christ. The salt of the earth must season everything, and the grace of God goes where it will. We must stop attending church and start being the Church. Anyone who is saved, or who will be saved, will be saved because of our prayers and all the prayers of any righteous, and all the saints, and because of who Christ is. I often ask you to invite people to church, friends and coworkers and family. And I now reiterate that. It's an important thing to do. But the inviting does something else beside the possibility of increasing attendance. It reminds people that there are people of faith that care about them. It reminds them that there is salt about, that there is a light somewhere. So even if they never attend, if they never visit, and they never become Orthodox, they will know that somewhere, there is somewhere that they are loved. The prayers that we pray and the icons that we paint and the beauty that we participate in are for everyone. They are universal. We must be faithful for the whole world.